BitMEX, a P2P cryptocurrency trading platform, owned by HDR Global Trading Limited, has its headquarters in Hong Kong. As of yet, BitMEX is not registered with any legislative board. Still, it is considered a trustworthy exchange because no hacks have been reported to date. Additionally, BitMEX has also taken extensive security measures to protect the digital assets of its customers. BitMEX functions more like a future trading platform as it allows the users to buy future and perpetual contracts. Even though the trading interface of BitMEX is simple, it is not popular among novice traders, because it only offers advanced trading options like margin trading with 100x leverage. Thus it is an exchange that is targeted to seasoned, professional traders. This BitMEX review will analyse several aspects to provide you with an all rounded detailed overview of the exchange and its services. Although Cryptimi does its best to provide you accurate info and to update it on regular basis, we strongly recommend that you to visit BitMEX .com for any updates which might occur afterward. Yes. BitMEX is considered a safe place to exchange cryptocurrencies. It protects the account of its users using 2FA (Two Factor Authentication) so that it is almost impossible for the hackers/fraudsters to steal information. In addition to this, BitMEX also provides the option of IP Pinning so that users will be notified if a login is made from an unknown device. Also, users can make use of the PGP encryption to avoid spam emails. BitMEX stores all the Bitcoins on a cold storage multi-signature wallet to ensure maximum protection for the customer’s funds. Whenever a withdrawal request is placed by the customer, it is manually verified by two BitMEX employees in order to be approved. Moreover, BitMEX exchange never stores any private keys on its cloud-based servers. BitMEX (Bitcoin Mercantile Exchange) functions as a P2P Crypto trading platform. As the name suggests, it allows users to buy digital currencies only using Bitcoins. It offers different types of trading contracts like Perpetual contracts, Future Contracts, Up Contract and Down Contracts. Bitcoins deposited by the customers are stored in cold storage multi-signature wallets. It requires multiple signatures to place a withdrawal request. Even if an attempt is made to hack the exchange, it is almost impossible to steal the customer’s funds as they are not only stored offline but also protected with multiple signatures. 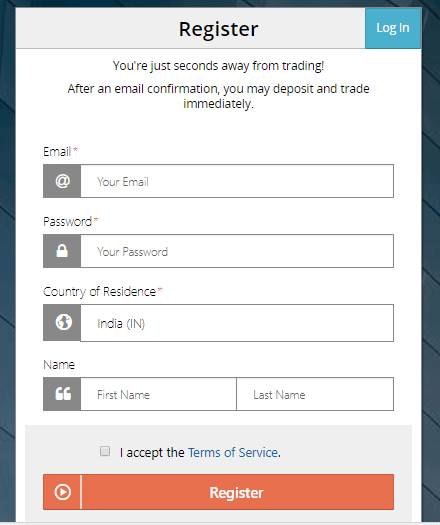 It won’t take more than a couple of minutes to create your account on the BitMEX exchange. The fee schedule is clearly mentioned on their website so that even a novice trader can understand it without any kind of difficulty. BitMEX supports password reset so that the users can reset that by following the instructions sent to their registered email address. Navigate to their site and click the ‘Register’ link located on the top right of the page. Within a few minutes, you should receive a confirmation email from the BitMEX team. Click the ‘Verify My Email’ link on that email to finish setting up your account. Congratulations! You have successfully created your account on the BitMEX exchange. Navigate to their site and click the ‘Log In’ link located on the top right of the home page. Enter your email address, password and click the ‘Log In’ button. If 2FA is enabled, then you should enter the authentication code to login to your account. Users don’t have to submit any kind of documents in order to exchange cryptocurrency using the BitMEX exchange. They can start trading immediately after creating an account. In case users lose their authenticator device for 2FA, then they need to submit the ID documents to reset the 2FA code. 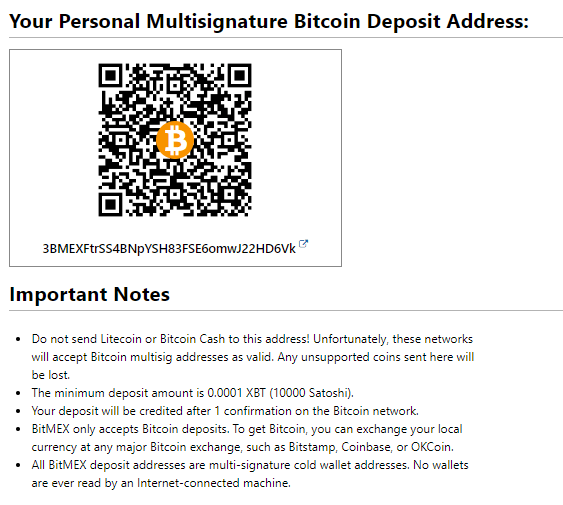 Follow the procedure below to deposit Bitcoins on BitMEX. Before making the deposit, you should ensure that the amount of BTC is greater than the minimum deposit amount. (Don’t forget to buy the Bitcoins from other reputed exchanges like Coinbase or Coinmama and store them on the exchange’s wallets or hardware wallets like Trezor and Ledger Nano S). Login to your BitMEX account. Click ‘Account’ from the top left of the page. Then click the ‘Deposit’ link. Here, you will be shown the deposit address to which you have to send the Bitcoins (BTC). If your wallet has a mobile app, then you can scan the barcode to get the address. Otherwise, you have to copy this address and paste it on your wallet to send the BTC. 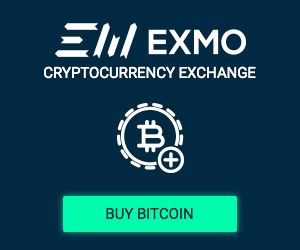 BitMEX exchange doesn’t accept fiat currencies like EUR, USD, GBP. The only available option to buy a digital currency on BitMEX is by first depositing Bitcoins (BTC). Apart from BTC, you cannot deposit any other altcoins. Users cannot buy or sell Bitcoins on the BitMEX exchange. Instead, they can only deposit BTC and use them to buy other altcoins. If they want to buy Bitcoins, then they can check out other reputed exchange like Coinbase, Coinmama or Binance. This example shows how to trade ETH using BTC. It is assumed that you have already deposited Bitcoins on your account. Login to your BitMEX account and click the ‘Trade’ link on the top left of the page. On the left side, you will see a heading named ‘Place Order’. From there enter the amount of digital currency you would like to exchange and select the type of order: Limit/Market/Stop Market. In this example, the Market order is chosen. It is not recommended to use the Market option as limits can get quite high with high leverage trades, as using the ‘Market’ tab counts you as a ‘taker’. If you use the Limit tab, you’re counted as a ‘Maker’ and BitMEX rebates you. However, using the limit tab comes with its own risks so be sure you’re experienced in margin trading before doing so. Click the ‘Buy’ button to place your order. ETC is not available on BitMEX. If you would like to buy ETC using a credit card, then Coinbase will be the best option. Alternatively, you can try Binance if you would like to buy altcoins using BTC or other cryptocurrencies. This example shows how to buy LTC using BTC.It is assumed that you have already deposited Bitcoins. Follow Step 1 from the section ‘How to buy Ethereum’. Follow Step 3 from the section ‘How to buy Ethereum’. This example shows how to buy BCH using BTC. It is assumed that you have deposited the Bitcoins already. BitMEX processes withdrawals only once in a day (13.00 UTC). Apart from BTC, users cannot withdraw any other cryptocurrency or FIAT. Click ‘Account’ on the top left of the page. Then, click ‘Withdraw’ button. Enter the receiving/destination address and the amount of XBT you would like to withdraw. To cash out using FIAT you can send your BTC to your Coinbase wallet and then cash out on Coinbase. Since your withdrawal requests are processed manually once in a day, you should ensure that the request is placed before the cut-off time. Otherwise, it won’t get included in that day’s batch. Note that BitMEX will send a confirmation email before processing your withdrawal request to keep you in the loop. BitMEX exchange allows its members to buy altcoins only by exchanging Bitcoins. BitMEX exchange accepts users from almost all countries in the world including the UK, EU, Australia, and Canada, but not from the US. If you are not residing in the US, then you can buy digital currency using this exchange. BitMEX exchange is not available to the residents in US. Coinbase is a good choice for the US residents as it is licensed and regulated to operate in almost all the states of the US. Every cryptocurrency exchange has its own fee structure and limits, and BitMEX is no exception. BitMEX exchange works on a maker/taker model and the trading fees depend on the type of order (contracts/futures) and the cryptocurrency. For Traditional Futures, when trading BTC, BitMEX rebates the maker trader 0.025% and charges 0.075% to the taker. That’s right! The maker earns a small compensation! It’s important to note that BitMEX fees apply on the entire leverage, not just the margin. For example, trades for $10,000 for XBT with 100x leverage is 100 [leverage] x $10000 [margin] x (0.075/100) [maker fee] x 2 [entry and exit] = $1,500. That’s a 15% fee. Since fees get high at high leverage, ideally the user does limit orders as BitMEX pays the maker trader 5% at 100x leverage through the rebate.The negative % indicates a rebate given to the trader for creating market liquidity, hence the ‘Maker’ term. Check out their landing page and scroll to the bottom, to know the exact fee for all the digital currencies supported by the BitMEX. BitMEX exchange doesn’t charge any fee to deposit Bitcoins (BTC). 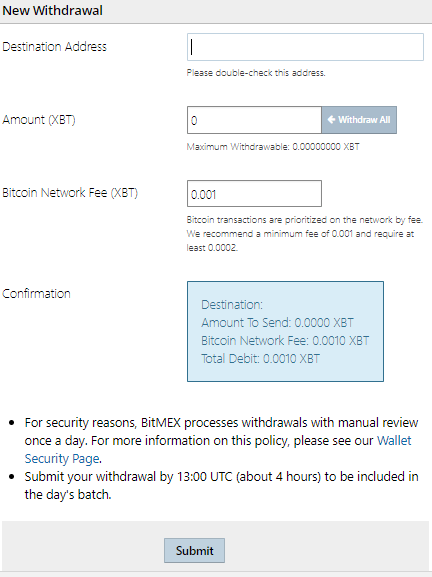 Except for the network fee, it doesn’t deduct any other fee to withdraw the BTC. The network is a fee based on the blockchain load and is a fee charged whenever a transaction occurs on the Bitcoin blockchain. This is also known as ‘Miners Fee’. BitMEX has not set any withdrawal limits for its users. However, it has set a value for the minimum deposit to trade. The minimum amount to trade varies from trade to trade, but if we consider XBTUSD (XBT is BTC), it is 1$ * 1% (Initial Margin) = $0.01. At XBT/USD price of $6500, this equals 0.00000154 XBT ($0.01/$6500). BitMEX doesn’t accept any type of fiat payment like credit/debit cards or bank transfer. Users must deposit only Bitcoins to start trading. To protect its customer’s account from unauthorised access, Binance exchange offers 2FA (Two Factor Authentication) via Google Authenticator or Yubikey. If the option Strict IP Pinning is enabled, then users will be notified of login from an unknown device. Whenever the user places a withdrawal request, BitMEX will start processing that only after getting confirmation from the user via email. This step will prevent hackers from making unauthorized withdrawals. As BitMEX stores all the Bitcoins on cold storage offline wallets, it provides better protection for the customer’s funds as cold storage wallet is the best option to secure altcoins than a hot wallet. If you experience any issues with your account, the best option is to contact their support team by submitting a ticket. To do this, simply visit their site and scroll to the bottom and click on ‘support’. Alternatively, you can contact the support via live communication channels like Weibo, Wechat (ID: bitmex), IRC and Telegram in Russian. Additionally, you can also refer to the FAQ / Knowledge Base section on the website. Even though BitMEX exchange is available on social media platforms like Twitter or forums like Reddit, it doesn’t provide customer support through these channels. BitMEX exchange will be adding the support for fiat based payments soon. You can check out the official blog of BitMEX, by visiting their site and scrolling down. to get the latest updates or news about the exchange. Both these exchanges charge a nominal trading fee and don’t accept fiat payments to buy digital currency. Binance accepts a bunch of altcoins to buy cryptocurrencies whereas BitMEX accepts only Bitcoins. When compared to BitMEX, Binance supports a large number of cryptocurrencies. Generally, BitMEX is considered more popular among the serious/professional traders because of its advanced features like margin trading. Even though the names of these two exchanges look similar, they differ in their functionality. Being a US-based cryptocurrency exchange, Bittrex accepts the residents in US whereas BitMEX accepts members from almost all countries in the world except the US. When compared with Bittrex, BitMEX only supports a limited number of cryptocurrencies. 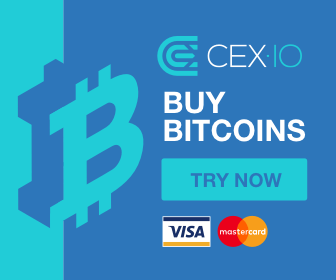 Regarding the payment methods, BitMEX currently accepts only Bitcoins whereas Bittrex allows its verified customers to buy cryptocurrencies using fiat currencies. BitMEX provides up to 100x leverage for the future and perpetual contracts whereas Bittrex doesn’t support margin trading. Often, these two exchanges get confused among novice traders because of the similarity in their names. BitMEX offers more leverage and advanced trading techniques when compared to Bitfinex. Even though both these exchanges aim to provide better security for the customer’s funds, Bitfinex has added more advanced security features (after the big hack) when compared to BitMEX which has never been hacked. Bitfinex accepts fiat-based payments via bank transfer whereas BitMEX only supports Bitcoin deposits. Regarding the fees, Bitfinex charges a marginal fee when compared with BitMEX for market purchases. We hope this BitMEX review gave you a better picture. To conclude, BitMEX offers advanced trading techniques for professional traders like margin trading. For novice traders, it allows them to buy the best altcoins using BTC and can be used as a gateway to margin trading for those looking to step up their trading. Regarding security, it stores the customers’ funds in cold storage wallets to protect them from unauthorized success. The only drawback of BitMEX is that it doesn’t accept fiat currencies and US residents. Also, the deposit and withdrawal orders can be placed only via BTC. Ethereum is not supported as a deposit. As the world's largest and highly advanced cryptocurrency exchange, Bitfinex, is headquartered in Hong Kong. The advantages that come with this exchange weigh out the shortcomings.